ALCONA GLEN P.S. - BARRIE NORTH S.S.
GOODFELLOW P.S. - HOLLY MEADOWS P.S. INNISDALE S.S. - KING EDWARD P.S. MINESING CENTRAL P.S. - OAKLEY PARK P.S. 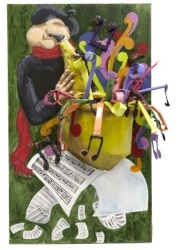 The imaJAZZart (image-as-art) Project was launched into local elementary and secondary schools in Barrie - Innisfil in early January, 2002. The project was initiated by Anita Arvast, co-ordinator of Georgian College's Web Design and Production programme. The Web Design and Production Department is applying its facilities and its many resources as the project progresses. Robin Munro, Chairman of the Barrie Jazz and Blues Festival, quickly came on board as a partner and committed all the Festival resources and dynamics necessary to encourage the success of the imaJAZZart project. This January marks just the beginning. imaJAZZart has a vision to go to national levels within the next few years as a component of the Canadian Jazz and Blues Hall of Fame Educational Outreach Programme. THE NEW VR is making a significant contribution to creating public awareness of the project by producing a documentary film covering its origins, development and completion. This documentary will then be made available to other communities wishing to participate in or undertake their own imaJAZZart programmes. According to Ms. Arvast, "The students in grades ranging from Kindergarten to grade eleven are working with nationally recognized visual and performing artists. The music is provided by Juno Award winning jazz ensemble "NOJO" (the Neufeld-Occhipinti Jazz Orchestra) and draws from the band's previously released recordings and from material to be released on a new CD this Spring. In addition, we are very fortunate to have several visual artists, who use Jazz music to inspire their art, working with the project and our students." "The imaJAZZart project represents one of many ways that The Festival has evolved in working with the community to expand and enhance our experience with the Arts," reports the project's co-developer, Robin Munro. "NOJO will have a great appeal to students of all ages because of the accessibility of their music," adds Munro. "Yet they also have a strong following and respect in the music world because of the high level of their compositions, orchestrations and performances." The most exciting part of imaJAZZart is a performance during The Barrie Jazz And Blues Festival VII - in June of 2002 - which unites the Visual Arts and Music in a dance of imagery. "We'll be displaying all of the student's art work in choreographed sequences as NOJO performs in the Georgian College Theatre," says Arvast. "While it promises to be a wonderful finale, I want to emphasize the considerable learning which is taking place leading up to this show." Along with developing the computer and artistic skills, students are watching first-hand how a community pulls together to plan and realize an event. Jennifer Copeland, Arts Resource Teacher for SCDSB, comments "This project provides schools and the arts community with a unique opportunity to participate in the Arts together. 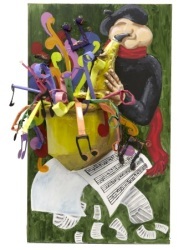 Students will extend their skills in music and visual arts as well as their communication skills. Ten classes are involved this year, with potential for further expansion next year." "The Simcoe County District School Board is focused on Student Achievement. Our goal is to improve student achievement in literacy and numeracy. In addition to the significant learning expectations that are met through the Arts curriculum, the Arts support and expand learning in other subject disciplines." Research conducted by The Ontario Arts Council: Making the Case for Arts Education 1997 stated, "Elementary school students who received an academic program integrated with visual and performing arts score significantly higher on standardized language tests and had higher report card grades in language arts, math, reading and social studies than other students." Further, "the skills the arts teach- creative thinking, problem-solving and risk-taking, and teamwork and communications - are precisely the tools the workforce of tomorrow will need." "The students will be significantly involved in the process from start-to-finish in some very exciting ways. Various media will also be utilized," adds Arvast. "We have had enthusiasm for this project from the outset, and the enthusiasm is most definitely reaching and inspiring the students." The enthusiasm, it is worth noting, has also extended internationally with contact from interested parties from as far away as South America and Italy. The support from the community for imaJAZZart has been immediate and substantial and the developers of the project are very grateful to all of their corporate sponsors which includes Molson Canadian, THE NEW VR, Georgian College, Rock95 and Star 107.5, Associated Integrated Systems and The Barrie Advance.